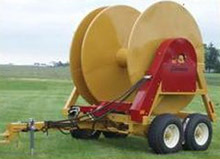 Storage and Starter Size Reels from 2 Hose up to 10 Hose Reel. 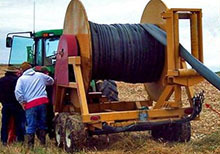 Store: Drag and / or Feeder Hose, or Supply line for Pivot Irrigation Hose. 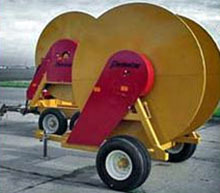 2, 3, and 4 Hose Reels Come Standard Stock with Dividers for ease of Hose Storage. Holds (8) 6" Feeder & (2) 6" Drag Hose. Features Hydraulic Drive - you never have to leave the tractor! 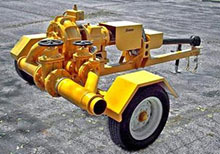 Pit Pal's heavy duty pump has the Power to agitate a pit, mixing those Bottom solids in to a pumpable slurry. Pit Pal's unique intake-port design provides constant chopping action - up to 5000 "shearing action" cuts per minute. 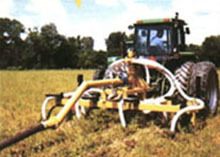 This cutting action assists in getting the straw and fibrous material chopped into a pumpable form. Pit Pal's handy gate valve permits agitating and/or pumping of "under-barn" or outdoor manure pits. Pit Pal is portable, giving you the flexibility to use it in many locations. Load your slurry wagon by combining your Pit Pal to force feed a vacuum Tank or over the top with Farmstar Portable Loadstand. 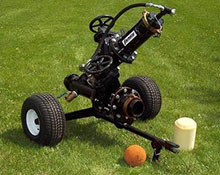 Pit Pal will operate as a priming system for your high pressure irrigation pump. Portable Loadstands have a towing height of under 10'. Maximum height is 12'6"
Farmstar Loadstand Tubes are now made out of Galvanized Steel.